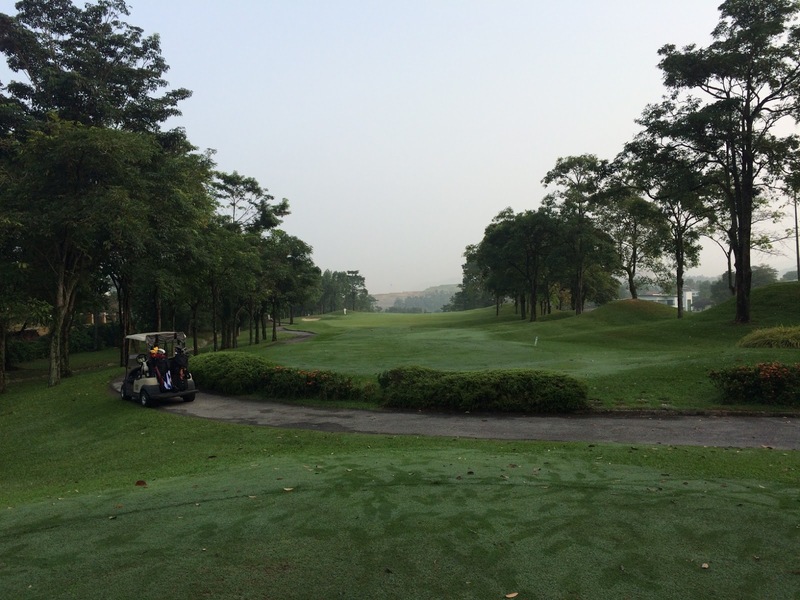 It was a wet and rainy start this morning at Impian Golf & Country Club delaying our tee off till around 8:30am. 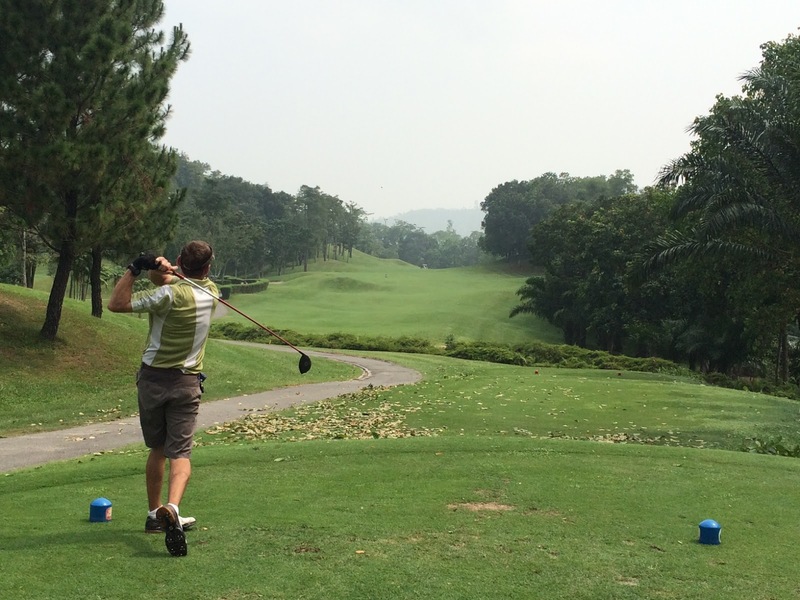 Even then the rain continued for a good 5 holes or so …. 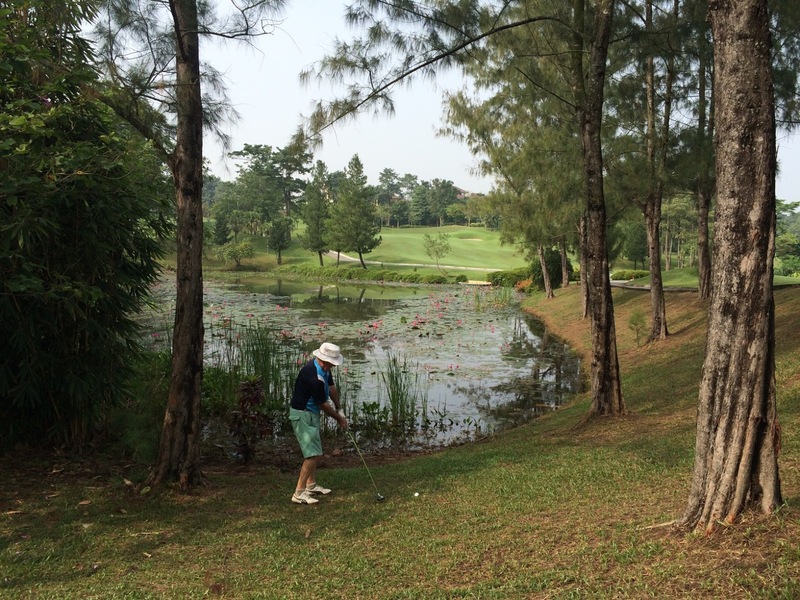 and then cleared … and then rained again on the 2nd nine for a few holes. On the positive side the course conditions were very good and the weather very cool with all the rain. We had 3 flights today and 2 of the flights finished by around 1:30pm and the other flight slightly later as they had been further delayed due to a rain stop. After the game 5 of us had a good lunch at the Crab House Restaurant in Taman Kasturi. I have photographed some strange things on many golf courses but today there was something REALLY strange … a fish … a very large half-eaten fish in the rough at the side of the fairway on the par 5 17th hole. Can only think a large bird of prey such as a large eagle had dropped this. 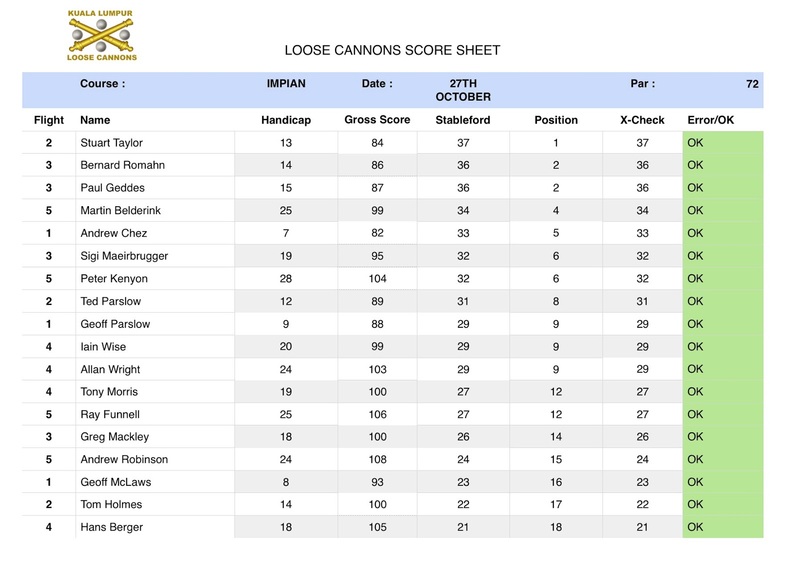 Sixteen Loose Cannons had signed-up for the game at this very nice course, they all made it in time except for myself as I was hit ~ 20 degree from behind while cruising at a comfortable speed on the triple lane highway. Time for my oldie to visit the body-shop again. Weather was nice, the course played a bit difficult today as the green were sanded. As many times before the slow walking playing members added to the time consumed, but in general takes more time to play. Nine assembled at the Crab House for the post game lunch, the food is good but the surroundings is like a mini war-zone area. So who had his game under control? – shared third Andrew Robinson, Stan Constantinides, Ricardo Castro and Mike Williams with 34 points. From next week I will be back home hugging my grandchildren and what have you back there so the following volunteers will take over; Paul Geddes will do 10/7, Kaz Takita 17/7, Ted Parslow 24/7, Kevin Wiggins 31/7 and Aftab Ahmad 7/8. Congratulation to the English and Swedish football teams to their victory and I look forward to see them play each other in the 1/4 final in Samara on Saturday. 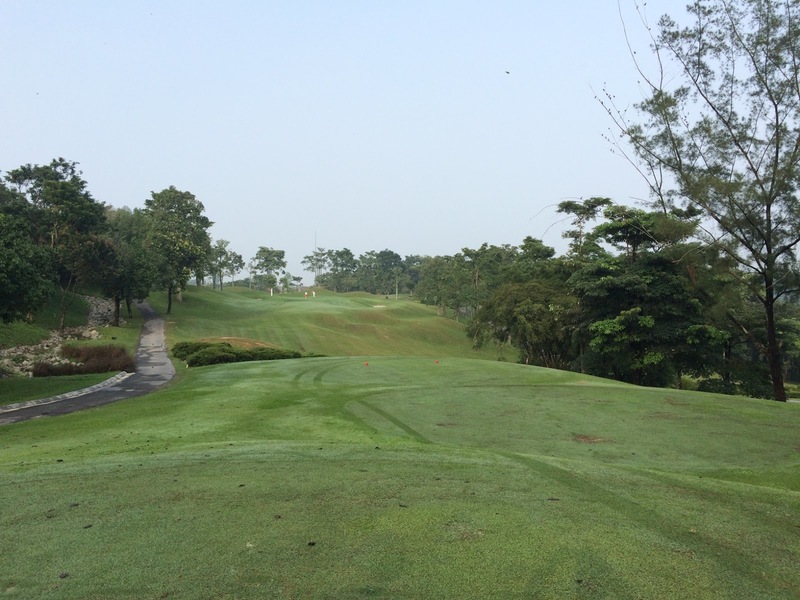 We had 5 full flights at Impian this week starting a little later at 8:30am (once the Convenor eventually arrived) and got off from two tee boxes. 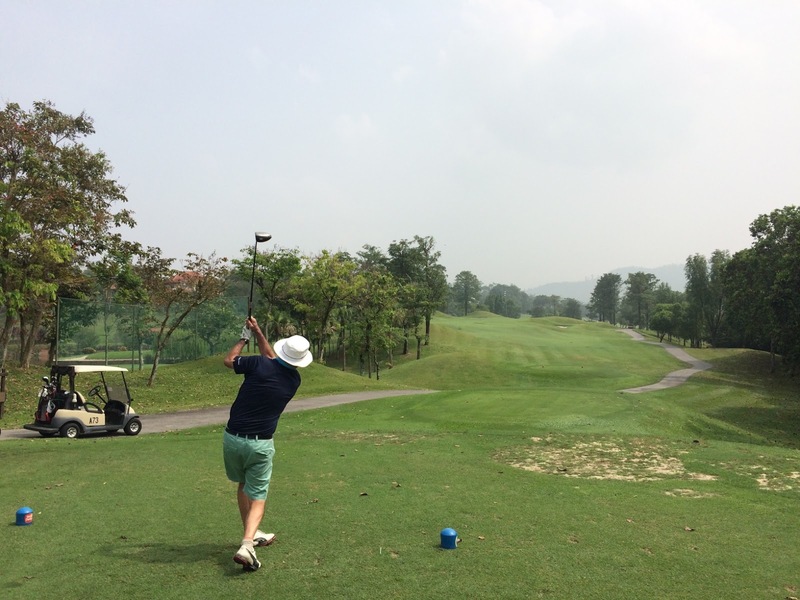 The weather was very hot and extremely humid and along with the very slow play we encountered made for a very exhausting 5 hour round of golf. 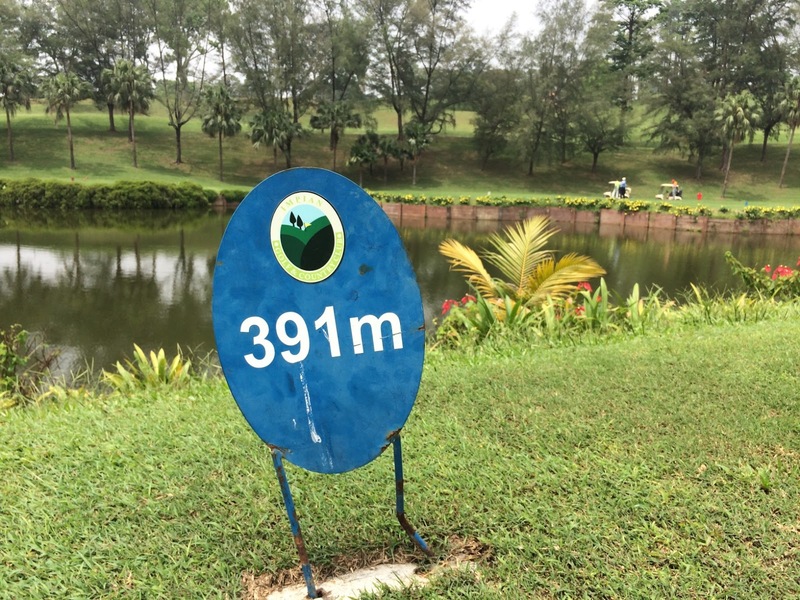 The course was in very good condition as it usually is although the greens were maybe on the slow side. We finished after 1:30pm so by the time we got to the restaurant and ordered lunch it was almost 3pm when we ate. Lunch and drinks were very kindly sponsored by Kaz Takita who was celebrating his big 70th birthday – a very Happy Birthday Kaz! Thank you very much. 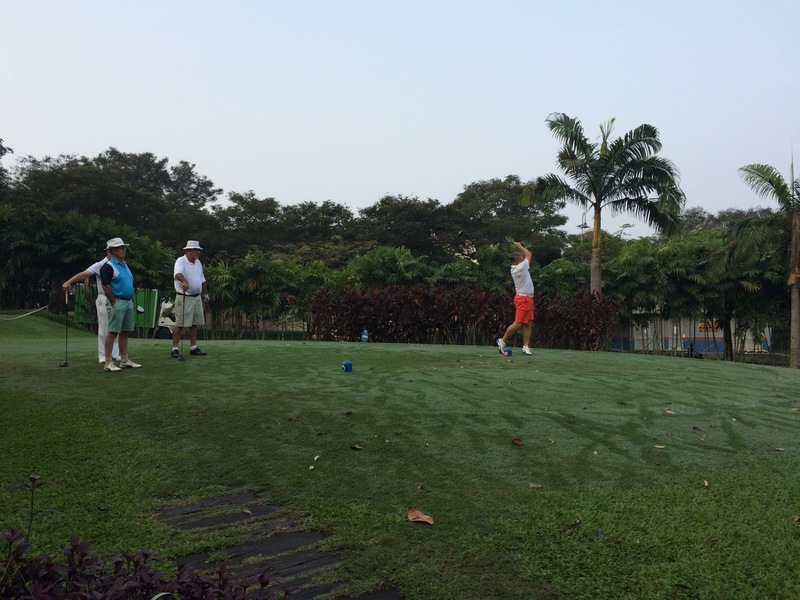 The pre-Christmas game was played at Impian Golf & Country Club with 23 players attending adorned in the traditional Christmas headgear. It was a later start today with an 8:30am tee off and it was slow going especially for the first 3 flights off the first nine who got held up a lot by a very slow group in front. 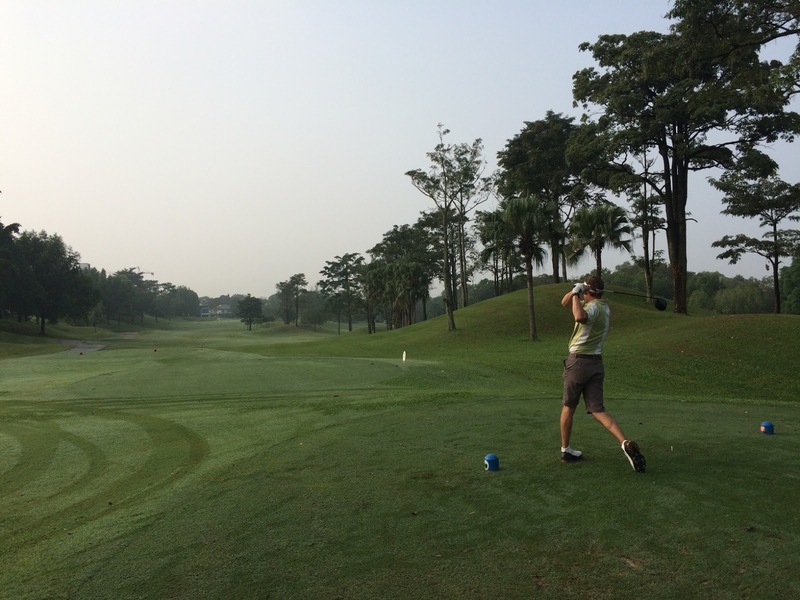 However the weather was good and the course was in great shape. After the game we had lunch at Kenwell Seafood Restaurant which was really good – we need to alternate between Kenwell and the restaurant opposite in future when playing at this side of town. 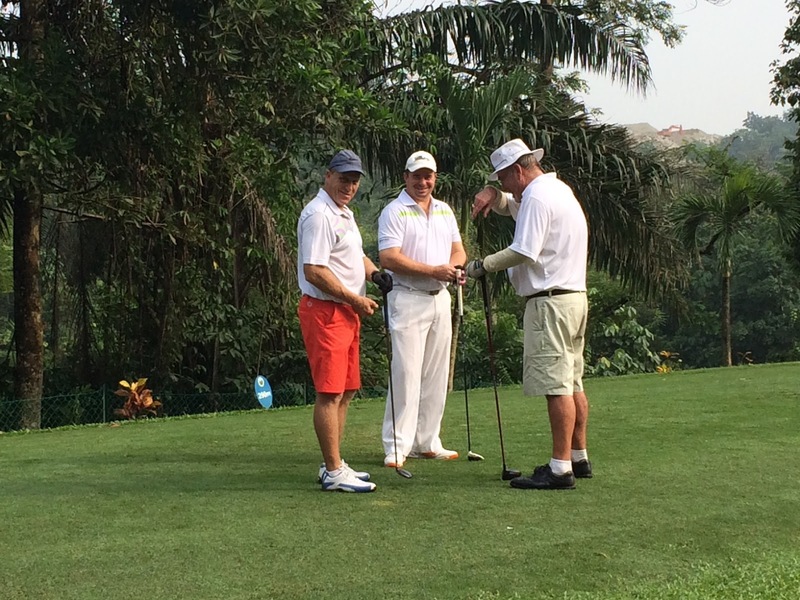 It was a later start today at Impian Golf & Country Club with a tee off time of 8:30. We got off from 2 tee boxes but it was a bit later than 8:30 and then because of very slow play it took us 5 hours to complete the round. It was therefore a very tiring and very hot day. 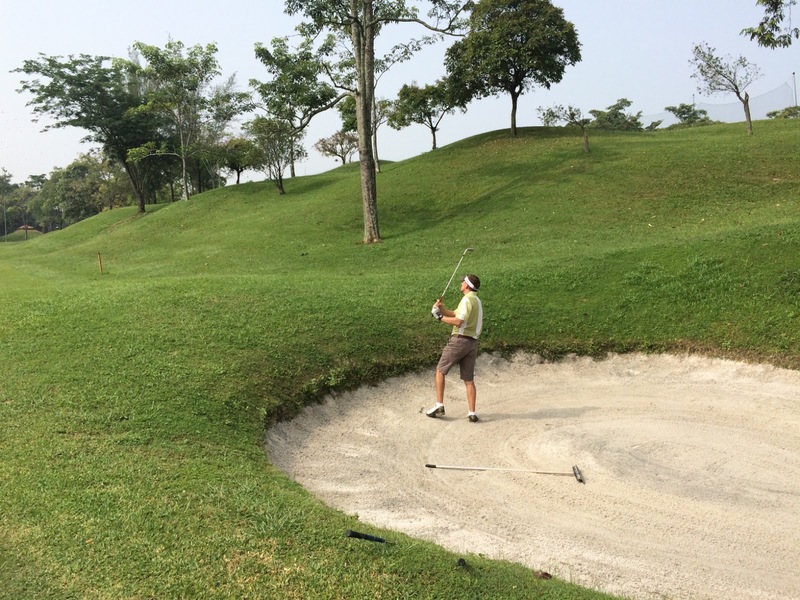 The course however was in good shape although the greens were a little sandy and uneven in places. Weather was good but hot so everyone was glad to finish and get to the restaurant for some cold beers. Luckily the restaurant, Fei Wai, was open all afternoon as 11 of us attanding the lunch got there close to 3pm. The restaurant has changed hands and is now called Kajang Crab …. food was still very good and reasonable so we will no doubt be returning here again. 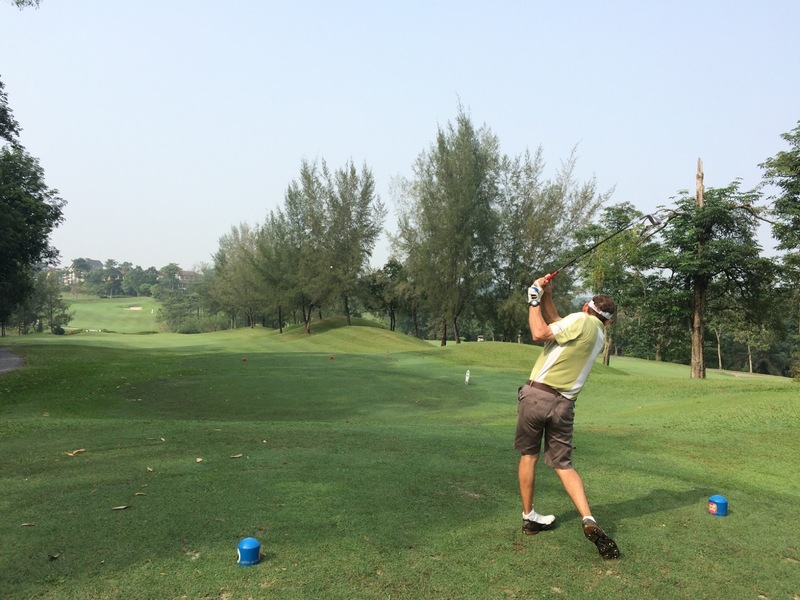 The clear winner today was Bernard Romahn with a tremendous round of 82 for 44 points …. surprising he wasnt’ there at the lunch to bask in the glory. 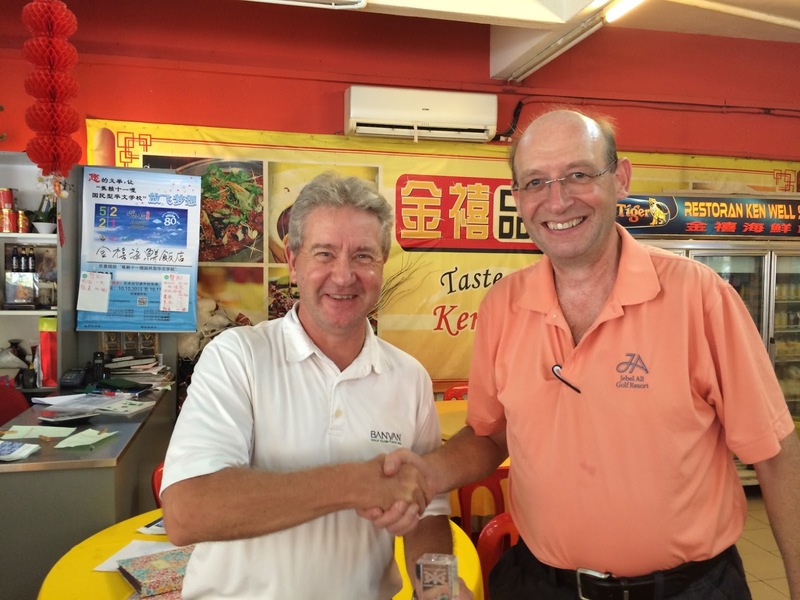 We did contribute his winnings to the pot towards lunch … thank you Bernard! Runner up was Ted Parslow with a 85 for 37 points. Best gross of the day was Geoff McLaws with an 80. Full scores below. 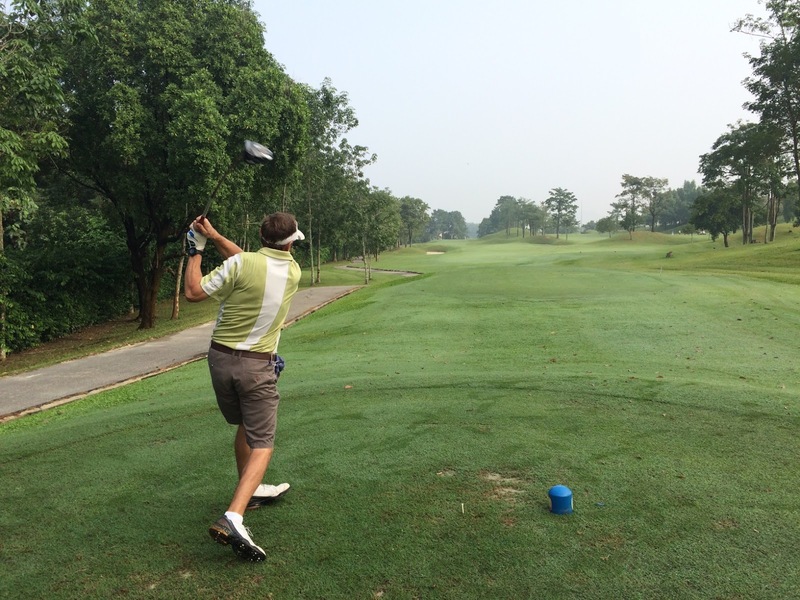 With an original 21 booked to play we had one last minute drop out resulting in 5 full flights and 20 players today at Impian Golf & Country Club. So with revised flights we got off from two tee boxes on a beautiful morning, although it did become a little steamy and humid later on. The course was in very good condition although the greens had just been sanded and were a little variable in their speed. 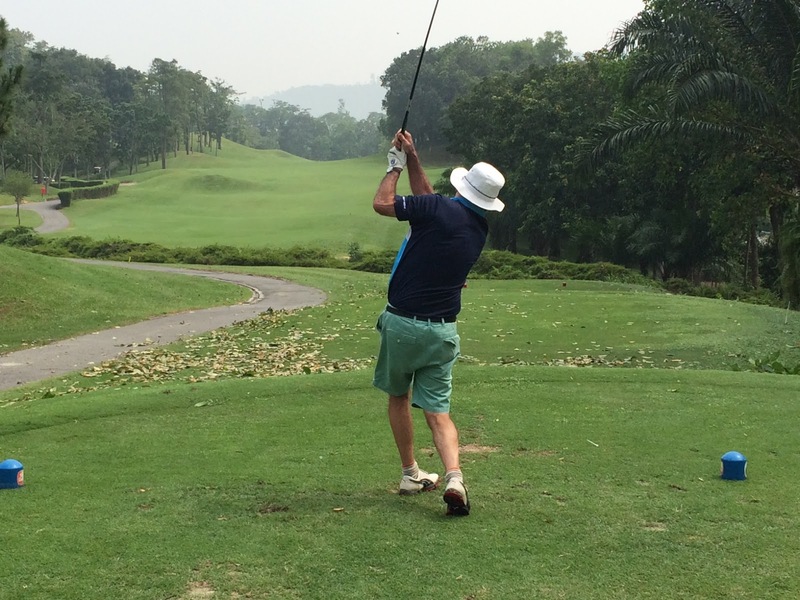 Rate of play was good and we all finished by 12:30 and then we headed off to Fei Wai restaurant for lunch ….. well at least 11 of us did! 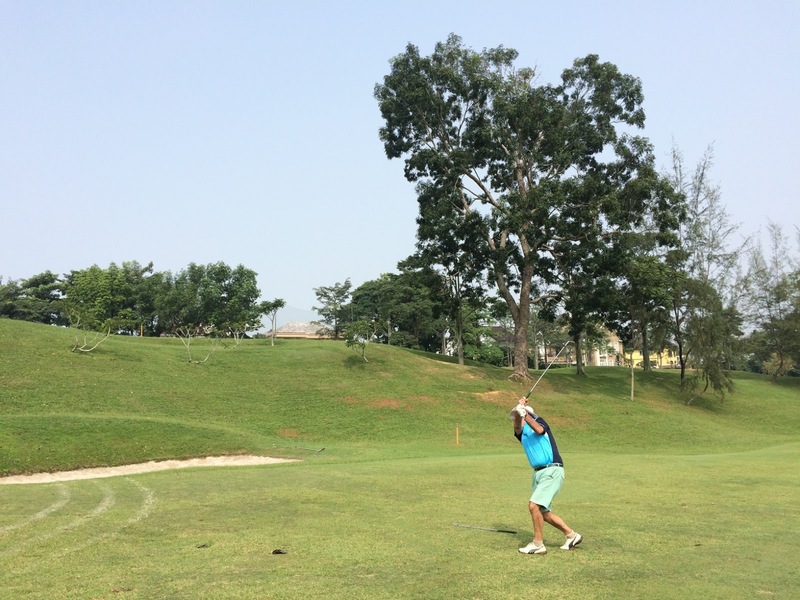 The monthly Trophy Game for February was played at Impian Golf & Country Club with 23 players participating. After a fairly efficient check in and registration we teed off from two tee boxes at 8:00 ++. There was a little confusion over the tees that we should have played from …… Impian normally does not have white tees so the message that was conveyed to the group teeing off from Tee No 1 was play from the Blues ….. but as there were White Tees in play today the groups playing from Hole No 10 apparently used the White Tees. 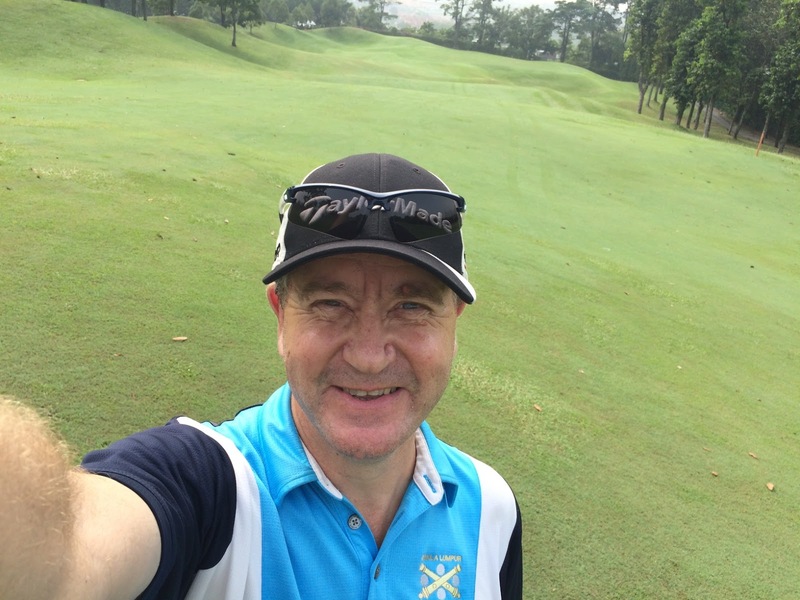 The course was in great condition and the greens rather tricky and difficult to read. Play was rather slow today as there were a few slow moving groups in front …. as Mike Smith was quoted over lunch he was annoyed at the “slow elderly players in front” …. rather choice coming from our most senior player I thought! 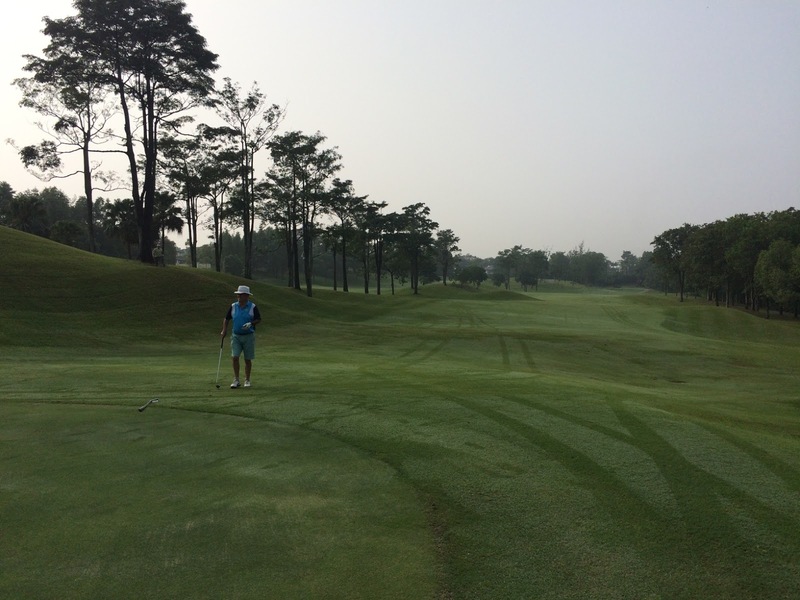 Weather was clear and fresh at the start but became very hot and sticky by the back 9 making it most exhausting. 13 of us had lunch at the restaurant opposite Kenwell Seafood as it was closed and it was on the whole pretty good but not quite as good as Kenwell Seafood. Although the prawns were reasonably priced they were rather small and rather overcooked. 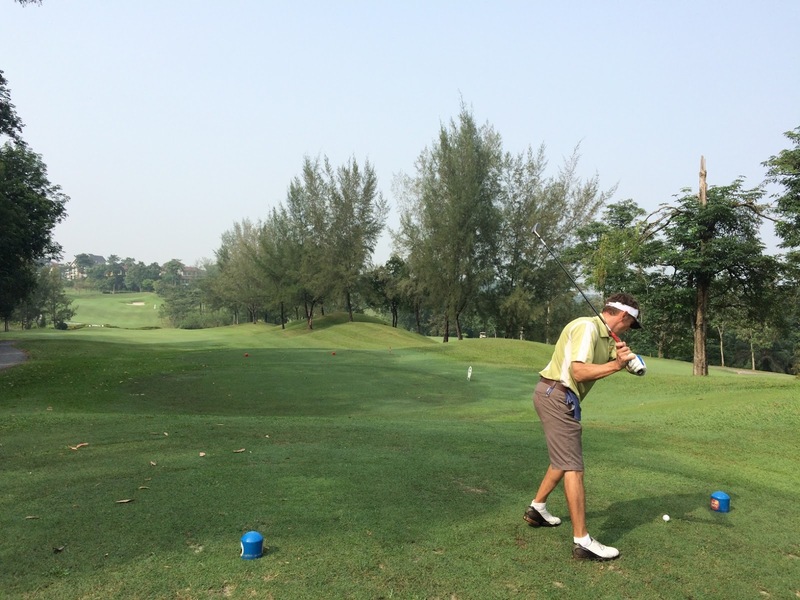 Conditions were good this morning for the October Monthly Trophy game at Impian Golf & Country Club. We had 18 players with Sigi taking up a last minute position when Ren Li cancelled. The course has been seen in better shape and again we played off the blue tees as the white tees seemed to have now disappeared from this course. Greens were good although some were a little bare in patches and inconsistent. After the game we adjourned to the reliable Ken Well Seafood Restaurant for an excellent lunch and drinks kindly sponsored by Ted Parslow celebrating his 100th Cannons game. Thank you Ted!